Aftermath of a nitrogen pipeline blast at the Boeing North Charleston, SC, facility. 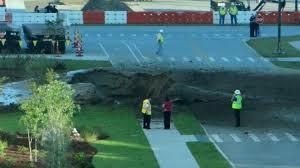 A nitrogen line ruptured at the North Charleston, SC, Boeing plant Thursday morning, leaving a gaping crater in the ground. The incident occurred at 6:30 a.m., said Robert Gross, a spokesman for Boeing South Carolina. He said an underground nitrogen line failed. Boeing uses nitrogen is in the production of the fuselages, Gross said. The rupture was next to the aft-body and mid-body production buildings, he said. A notice sent to workers said the line that failed was between buildings 88-19 and 88-20. The notice assured workers there was no danger to them or the environment and the nitrogen lines shut off immediately. From photos taken at the scene, officials said the crater was big enough to drive a car into where the line had ruptured. Boeing makes its 787-8 and 787-9 wide-body commercial airplanes at the North Charleston campus as well as at a sister facility in Everett, WA. The North Charleston facility, beginning in 2016, will be the only site to produce the 787-10 — the Dreamliner line’s longest and most fuel-efficient model.